I had two finishes this week. I love this sweet stitch. I plan to use it as a Christmas ornament at Grimmwood. And I am hoping to have it finished by the famous, Vonna Pfeiffer. I sent her an email about getting on her List! She is kind of like Santa, you want to be on her Good List. Since I do not need mine finished until Christmas 2019, I hope I get on the list. I also finished this Hands on Design February. I made some changes to the chart and I am going to take my time finishing this one!! This is the weekend for our North Alabama Stitching Retreat in Huntsville. I have my Mystery box ready for the exchange. I will share the box I took on Monday and the box I received on Tuesday. Lots of ladies from North Alabama Stitchers will be attending the retreat as well as some other ladies from the area. This will let me know if I am a "retreat" person. So far I have found the stitching community to be one that is very easy to embrace. It seems stitchers become instant friends. Nest Saturday I will share some pictures from the Retreat. Enjoy the retreat and we will look forward to hearing all about it. Like your stitching choices this week. Both are such cute finishes Arlene. I can't wait to hear about the retreat and if you liked it. Love both of your finishes, Arlene! 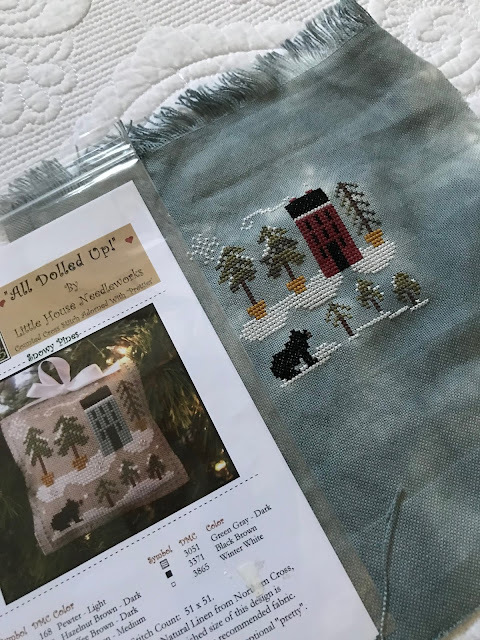 What fabric did you use for the bear stitch? Since it isn't overly Christmasy, you could leave it out much of the winter. I hope you have a fabulous time at the retreat. A stitching retreat sounds like fun, hope you enjoy it. Arlene, what will that Vonna person do to finish your project? Frame it? Love your ♥ Day lovely. Very nice! The top piece is so cute! Why is Vonna famous and what does she do that's so special? Have fun at your retreat! Your finishes are great!! 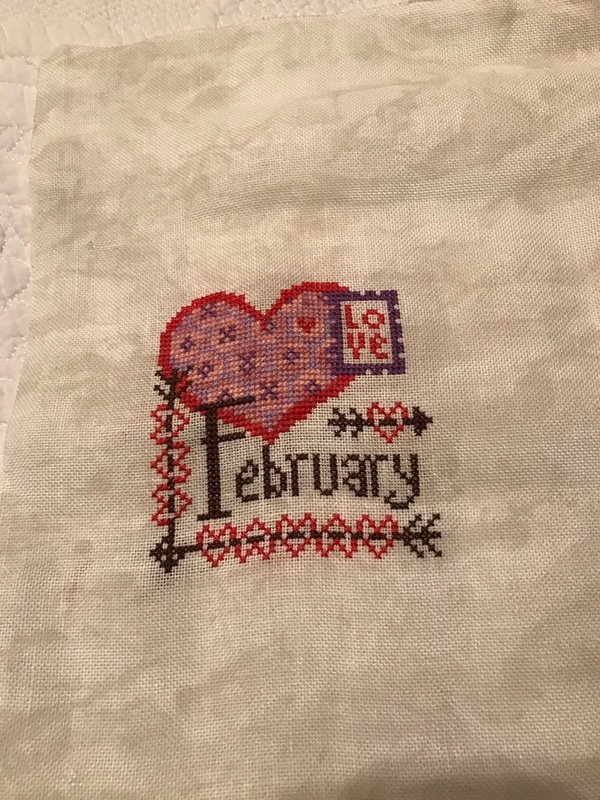 Love the February! Mari...your comment did not post for some reason....Vonna is a famous Finisher in the Stitching World. I have admired her work for years and decided to see if I could get a Christmas ornament finished by her. If you check out her blog on my blog roll you can see some of her work...She is The Twisted Stitcher. Beautiful stitching! The blue one is restful and so pretty. Like the Valentine one as well. Enjoy the stitching retreat. I've never been to one. Hi Arlene! I believe Vonna is scaling back this year but I know a finisher who is just as good as Vonna. And on top of that she is right here in Decatur. If you want more info just email me (and no, it's not me!I'm just a stitcher), I can send you pics of things she's done for me if you'd like.